Court records released yesterday show the RCMP interviewed a number of high-profile people after suspended Senator Pamela Wallin said she had official meetings with them. Here are the top four who were interviewed by police. 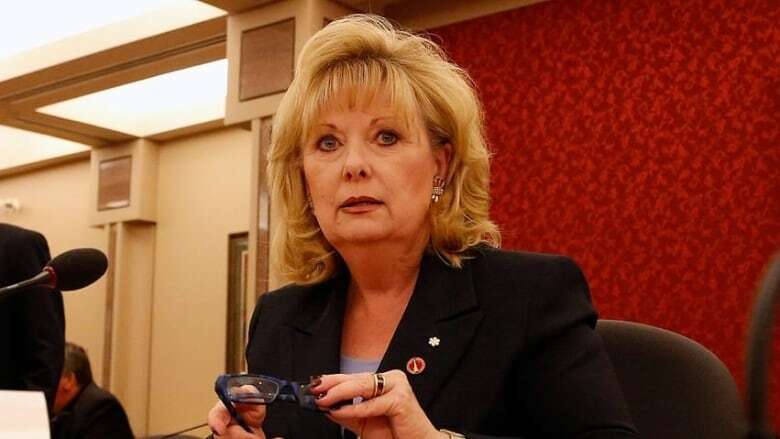 Court records released yesterday show the RCMP interviewed a number of high-profile people after suspended Senator Pamela Wallin said she had official meetings with them. The Mounties are investigating Wallin's Senate travel expenses and allege she claimed 24 trips that weren't related to her work as a senator, for a total of $27,493.72. Wallin told auditors at Deloitte, who examined her expenses at the request of the Senate, that she had official business with a number of prominent people. That led the RCMP to meet with them to try to verify Wallin's claims. None has been implicated in any wrongdoing. Most told the RCMP that they had not met with Wallin on the date she had given. Wallin says she has done nothing improper but says her office made some errors. She says that, out of an abundance of caution, she has repaid $154,191.29 to the Senate. "Senator Wallin used public funds to travel to Toronto in order to pursue these private and business interests," Cpl. Rudy Exantus wrote in an affidavit filed Jan. 27. "Senator Wallin, when confronted by an external audit, misrepresented the nature of these trips to Toronto, and ... [fabricated] meetings which the RCMP was able to determine (through interviews) to have never taken place." The RCMP says it discovered at least two events at which Wallin wasn't on the guest list, but organizers say it's possible she could have gone with an invitee or simply walked in. Here are the top four prominent Canadians Wallin said she met with. ​Wallin was on the board of Porter Airlines between 2008 and 2013, and attended regular board meetings in Toronto. Porter was one of two companies that was subject to the production order made public Monday as the RCMP seeks additional documents to show whether Wallin was reimbursed twice — once by the Senate and once by the companies on whose boards she sat — for the same trips. Both Porter and Gluskin Sheff, the other company on whose board Wallin sat, reimburse directors for travel and expenses incurred for board meetings. Deluce confirmed he had met with Wallin on the dates listed and that she had represented Porter at a number of events, according to the court documents, known as an Information To Obtain a production order, or ITO. Deluce was interviewed by the RCMP on Sept. 23, 2014, according to the court documents. Based on that interview, Exantus wrote in the court documents, "I also believe that Senator Wallin may have received reimbursement from Porter for some expenses incurred" during her trips to Toronto. The RCMP note in the ITO that "Neither... Gluskin Sheff and Associates Inc., nor Porter Airlines Inc., is under investigation for the named offences." The Mounties believe Wallin committed breach of trust and defrauded the Senate of an amount exceeding $5,000 between Jan. 26, 2009, and Oct. 3, 2012, according to the ITO. One of Wallin's calendars listed a March 2010 medical appointment, written as "[Echocardiogram], 3rd floor, Peter Monk [sic] Rm 530, Toronto General." The Peter Munk Cardiac Centre is located at Toronto General Hospital. But a spreadsheet provided to Deloitte said that Wallin was meeting with Munk himself, the founder of Barrick Gold. 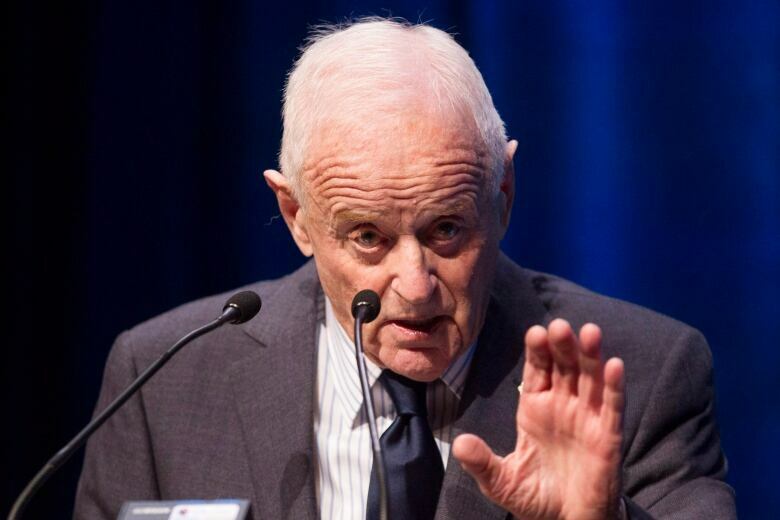 Barrick Gold's chairman and founder Peter Munk. (Chris Young/ Canadian Press)"Senator Wallin, in an interview with Deloitte, said that Peter Munk is someone she knew for a while and tries to keep in touch with.... Senator Wallin said that this generally can be called networking," Exantus wrote. Munk, however, told the RCMP that while he knows Wallin, she isn't a personal friend. He also told the RCMP that he was in Switzerland on the date she claimed she was meeting with him, although he allowed that they may have spoken by phone or that she could have met with Barrick's president or CEO. He said that he has never had a private lunch or dinner with Wallin. A spreadsheet provided to Deloitte by Wallin's office says she flew to Toronto on Sept. 15, 2009, in part to attend a fundraiser for Dignitas International, a humanitarian organization with a focus on HIV/AIDS-prevention and treatment in Africa. The spreadsheet entry noted that Dr. Samantha Nutt, founder of War Child, was there. Dr. Samantha Nutt, co-founder of the Canadian charity War Child. (CBC)Dignitas told the RCMP that it does not have a record of Wallin on the event's guest list. Nutt told the RCMP that she doesn't recall going to the reception, nor is it listed in calendars belonging to her or her husband, Ontario cabinet minister Dr. Eric Hoskins. Wallin's schedule shows she also had an Ontario university chancellor's dinner listed for the same time. Wallin was then the chancellor of the University of Guelph. A spokeswoman for the Council of Ontario Universities confirmed that Wallin attended the dinner. ​The Walrus Foundation is the non-profit organization that supports The Walrus magazine. Wallin's schedule suggested she met with the editorial staff at the Walrus on Jan. 13, 2010, to discuss Canada's role in Afghanistan. Wallin was on the Senate defence committee and had served on a blue-ribbon panel examining the future of Canada's Afghan mission. But the investigator notes that an RCMP forensic investigation found the entry was only made in the electronic calendar in May 2013, and wasn't present in January 2010. Ambrose told the RCMP she's a "very close friend" of Wallin, according to the ITO, and that her calendar on that date lists "dinner." John Macfarlane, editor of the Walrus, said he remembers Wallin meeting with the magazine for an editorial board meeting, but he can't confirm the date. An entry for Jan. 11, 2010, had listed "Shelley and Doug" — Ambrose's partner's name is Doug — but it was later changed to "[Meeting] B. Johnstone." The spreadsheet Wallin provided to Deloitte said she was invited to a dinner at the home of a senior adviser at the Canadian International Council. Robert Johnstone, who had worked with the Canadian International Council, told the RCMP that he may have hosted Wallin at his home, but never to discuss business. He told the RCMP he couldn't remember the dinner Wallin's spreadsheet described.